October and November were hot for fiber and infrastructure M&A, and now December has one already too. Ohio-based Everstream has struck in Michigan for the second time in 2016. They have signed a definitive agreement to acquire Lynx Network Group. 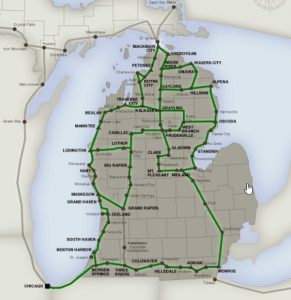 Kalamazoo-based Lynx Network Group operates a 1500 mile statewide fiber network that complements Everstream's existing Michigan footprint, acquired over the summer when they purchased GLC/Comlink. The Great Lakes region and Michigan in particular had long held a pocket of independent network operators that somehow sidestepped the earlier national waves of consolidation. Everstream and its private equity backers, however, have clearly decided that was an opportunity. I wonder if they'll go after US Signal next. Just yesterday, Everstream announced the sale of two properties they had acquired in the GLC/Comlink deal. The first was a facility holding 93,108 square feet of office and warehouse space in Holt, Michigan for $3.72M and the other was for GLC/Comlink's former headquarters a few miles to the north in in East Lansing for $900K. They said the proceeds would be used to help fund additional acquisitions, and apparently they meant it. Financial details were not disclosed, but the purchase is expected to close in January of 2017. The deal will expand Everstream's coverage to more than 1,000 on-net buildings, including 27 of the region's key data centers.